By simply pressing a button, your pendant will instantly activate the base unit located in your home. This unit will immediately alarm our Central Monitoring Station, initiating two-way voice communication between you and our operators. Using highly sensitive microphones that amplify up to 150 feet away from the base unit, a reassuring voice will come through over the base unit to ask if everything is okay. If there is no response, we will contact the proper authorities. The pendant, uniquely developed by Life Alert, is wireless and waterproof (you can shower with it). It measures only 2" x 2" and is as light as a feather. It can be conveniently worn around your neck or on your wrist. When pressed, the pendant will transmit a signal to the base unit up to 150 feet away, notifying our Monitoring Center. 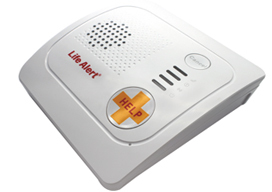 The Master Unit has been developed by Life Alert's research and development department and is exclusive to Life Alert.